Any restored kiosk will benefit greatly from having a ‘period style” looking interior installed. Please check our projects page for some examples. Our reproduction ‘Jubilee’ interior certainly looks the part and is supplied with period style notices (laminated to protect from any damp). Different options are available depending on your budget. 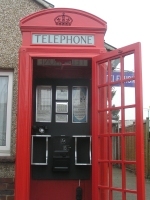 It can be supplied as just the basic backboard and shelf unit, or complete with notices ready for mounting your own telephone and “A and B” box, or (subject to availability) fully complete with telephone and repainted “A and B” box.